Check this out! We’ve found some keys, and one of them is said to be the key to Mrs. Grunkle’s front door. 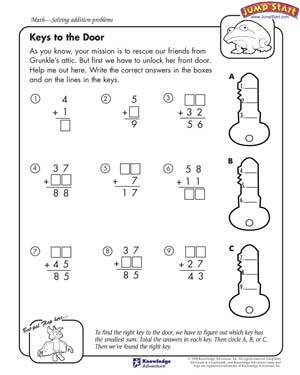 If your fourth grader could just solve the addition problems on the page, we’ll know for sure which key is the right one. Once we’re in her house, it won’t be long before we’re rescuing our friends from the attic!